ESA’s X-ray observatory XMM-Newton has revealed a new class of exploding stars – where the X-ray emission ‘lives fast and dies young’. The identification of this particular class of explosions gives astronomers a valuable new constraint to help them model and understand stellar explosions. Exploding stars called novae remain a puzzle to astronomers. “Modelling these outbursts is very difficult,” says Wolfgang Pietsch of the Max Planck Institut für Extraterrestrische Physik. Now, ESA’s XMM-Newton and NASA’s Chandra space-borne X-ray observatories have provided valuable information about when individual novae emit X-rays. Between July 2004 and February 2005, the X-ray observatories watched the heart of the nearby galaxy, Andromeda, also known to astronomers as M31. During that time, Pietsch and his colleagues monitored novae, looking for the X-rays. 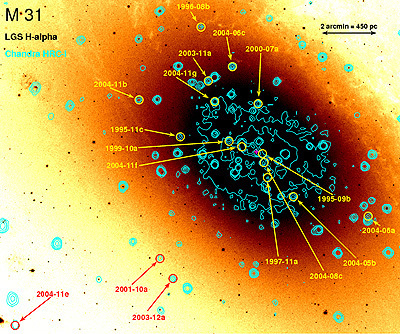 They detected that eleven out of the 34 novae that had exploded in the galaxy during the previous year were shining X-rays into space. “X-rays are an important window onto novae. They show the atmosphere of the white dwarf,” says Pietsch. White dwarfs are hot stellar corpses left behind after the rest of the star has been ejected into space. A typical white dwarf contains about the mass of the Sun, in a spherical volume little bigger than the Earth. Given its density, it has a strong pull of gravity. If in orbit around a normal star, it may rip gas from the star. This material builds up on the surface of the white dwarf until it reaches sufficient density for a nuclear detonation. The resultant explosion creates a nova visible in the optical region for a few to a hundred days. However, these particular events are not strong enough to destroy the underlying white dwarf. The X-ray emission becomes visible some time after the detonation, when the matter ejected by the nova thins out. This allows astronomers to peer down to the atmosphere of the white dwarf, which is burning by nuclear fusion. At the end of the process, the X-ray emission stops when the fuel is exhausted. The duration of this X-ray emission traces the amount of material left on the white dwarf after the nova has ended. A well determined start time of the optical nova outburst and the X-ray turn-on and turn-off times are therefore important benchmarks, or constraints, for replication in computer models of novae. Whilst monitoring the M31 novae frequently over several months for the appearance and subsequent disappearance of the X-rays, Pietsch made an important discovery. Some novae started to emit X-rays and then turned them off again within just a few months. “These novae are a new class. They would have been overlooked before,” says Pietsch. That’s because previous surveys looked only every six months or so. Within that time, the fast X-ray novae could have blinked both on and off. In addition to discovering the short-lived ones, the new survey also confirms that other novae generate X-rays over a much longer time. XMM-Newton detected seven novae that were still shining X-rays into space, up to a decade after the original eruption. The differing lengths of times are thought to reflect the masses of the white dwarfs at the heart of the nova explosion. The fastest evolving novae are thought to be those coming from the most massive white dwarfs. To investigate further, the team, lead by Dr. Pietsch, have been awarded more XMM-Newton and Chandra observing time. They now plan to monitor M31’s novae every ten days for several months, starting in November 2007, to glean more information about these puzzling stellar explosions.